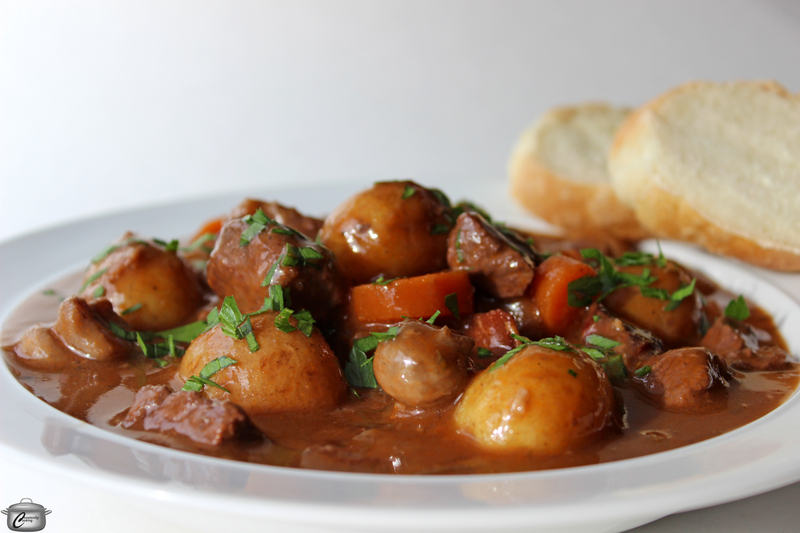 So many people mention stew when the topic of comfort food comes up. 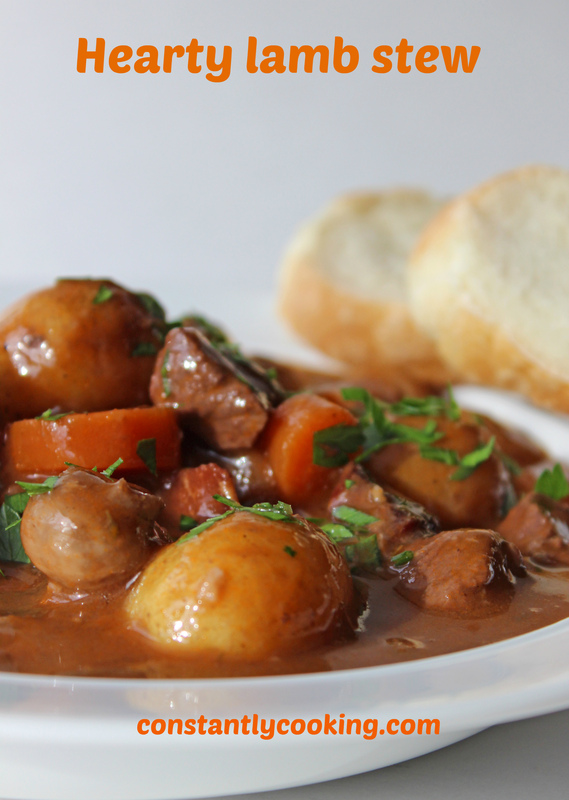 Warming and delicious, stew can be prepared many different ways with a host of different ingredients. I often make beef or chicken stew, but a yearning for lamb led to this this recipe’s creation and it was a huge hit. I bought a bone-in lamb leg on sale and cut it into cubes myself; if you’re pressed for time, call your butcher and have them do it for you! Serve this with warm crusty bread to mop up the delicious gravy. Cook bacon in a large Dutch oven or heavy, oven-safe pot placed over medium heat until crispy, stirring often. Once cooked, transfer to a small bowl with a slotted spoon, leaving bacon fat in pot. Put flour, salt and pepper in a small plastic bag. Add meat cubes, 10 or 12 at a time and shake in bag to coat with flour (you’ll need to hold bag closed as you shake). Put Dutch oven back on medium heat and carefully remove lamb from flour bag, tapping off excess as you work, and add to hot pot. Don’t overcrowd the meat in the pot or it won’t brown nicely. Remove each batch of meat to a large bowl when nicely seared before adding more to pan. When lamb is all browned, add a bit of oil to the pot if it looks dry and sauté onions for 3 – 5 minutes, stirring often. When onions are translucent, add garlic and cook for 1 minute. Transfer the onions and garlic to the same bowl as the browned lamb. Add the butter to the pot along with the sliced mushrooms. Cook, stirring often, until mushrooms have released their moisture and are just starting to get a bit crispy. Return bacon, lamb, onions and garlic to the pan. Add broth to pot and stir gently to release the browned bits stuck to the bottom of the pan. Add red wine, Dijon, tomato paste and thyme and stir again. Cover pot and bring the mixture to a boil then add in potatoes and carrots. Bring to a boil again then cover and transfer to the preheated oven. Let cook for 1.5 hours. Check once or twice and add a few tablespoons of water or red wine if the liquid has evaporated somewhat and the meat is not covered. Note that the stew can be made ahead to this point and refrigerated, tightly covered, for up to 48 hours until ready to reheat and serve. Just before serving, remove pot from oven and taste, adding add salt and pepper to your liking. Serve hot, garnished with parsley. This entry was posted in dinner and tagged carrots, comfort food, hearty, lamb, lamb stew, make-ahead, one-pot meal, Paula Roy, potatoes, rich, stew, what's for dinner. Bookmark the permalink. Not sure our vegetarian member would agree 🙂 but maybe!